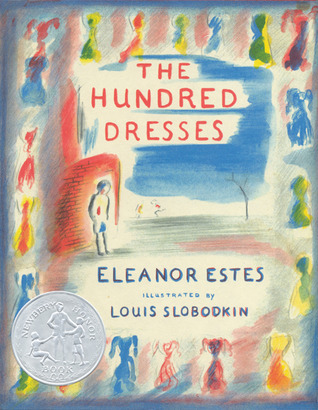 The Hundred Dresses is a short realistic fiction novella by Eleanor Estes that received a Newbery Honor in 1945. It is a story, based in part on the author’s childhood, about the impact of bullies. Wanda Petronski is a poor Polish-American immigrant, who comes to school each day in the same clean but shabby blue dress. One day, when her classmates tease her for her unusual last name and style of dress, Wanda claims to have one hundred dresses all hanging in her closet From then on, Peggy and her best friend, Maddie, ask Wanda every day how many dresses she has, punishing with their taunting her for what they know must be a lie. It is only when Wanda’s family leaves town to escape the cruelty of their neighbors that Maddie - who is the story’s main character - feels a sense of remorse for what she has done. Though some things make it clear that this story is not set in the present day, for the most part, I was amazed at how well this book holds up 67 years after it was first published. Entire lifetimes have come and gone since the book was first written, and yet kids still need to learn the same hard lessons. The relationship between Maddie and her best friend, Peggy, who leads most of the teasing, reminds me of so many friendships I have read about in children’s fiction. Peggy can be likened to Wendy, who makes whale jokes about Linda in Judy Blume’s Blubber, or even to Jennifer in E.L. Konigsburg’s Jennifer, Hecate, Macbeth, William McKinley, and Me, Elizabeth, who makes demands upon Elizabeth to prove their friendship. Today’s “mean girls,” who appear in practically every middle grade novel about female friendship, all seem to follow in the footsteps of Estes’s Peggy. I tend to think of bullying as a new phenomenon, because we talk about it more nowadays than ever before, but this book reminds everyone - kids and adults - that cruelty has been around for a long, long time. Just after I finished reading The Hundred Dresses, I read on School Library Journal that the Open Circle Program at the Wellesley Centers for Women has named it the number one best book for Kids’ Social and Emotional Learning. I instantly understood why. Reading books helps kids become more empathetic - reading books about bullying helps kids step into the shoes of both bully and victim and hopefully gets them thinking about why they would not want to be cruel to a classmate. I certainly don’t think books alone will combat the problem of bullying, or provide a complete emotional and social education, but this book is a perfect choice for getting the conversation started and for getting kids to think critically about their behavior. By taking a kid’s eye view of a real-life bullying situation, it gets away from the preachy tone of well-meaning adults and instead give kids the power to make the right choices, and to make amends when they do the wrong thing.